We have a few copies of the album available via our Bandcamp page. The Twelve Hour Foundation have reached new levels of radiophonic and melodic excellence with this record. They obviously know and love their sources, but unlike many others working with these influences, it’s no heavy handed historical re-enactment that falls back on lo-fi production or ponderous fictional back story. Instead it’s a sparklingly produced, fresh distillation of the spirit and bright breezy feel of classic British library electronics and BBC recordings. The hauntologically-minded Bristol-based duo of Polly Hulse and Jez Butler follow their excellent 2013 debut ‘Lighter Side Of Concrete’ (made using only the sounds of household objects) with a second fulllength that doesn’t disappoint. With the gentle pulse/bird song field recordings of ‘Knowing You’re Here’, the chirpy Human League mew-mews of ‘Analogjam’ and the distant dancefloor thump of ‘Sprudel’, their self-defined pop concrète genre is one liking very much. A proper delight of a record. Whilst the Bristol-based duo of Jez Butler and Polly Hulse having been in recorded circulation as The Twelve Hour Foundation since 2013’s The Lighter Side Of Concrete LP, it’s only now with a move on to Castles In Space that they appear to be gaining wider traction. 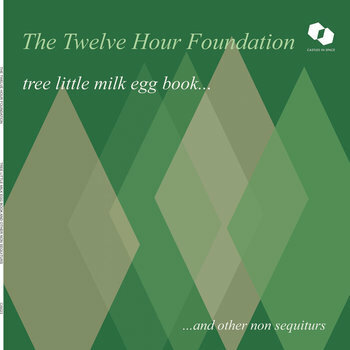 Following swiftly on from the recent Bunch Of Fives EP, the curiously-titled tree little milk egg book… and other non sequiturs is an agile and assured leap forward. Rounding-up ‘pop concrète’ idioms from their discography to date as well as adding in a string of new ones, Butler and Hulse have laid on a smorgasbord of sonic-food fusions, cooked-up with vintage synths, field recordings, household objects and more. Rewinding to a time when the BBC’s Radiophonic Workshop was a crucible of off-kilter creative freedom and hoovering-up ideas from more recent likeminded disciples, the LP shifts defiantly yet laterally backwards to propel itself forwards. After opening with some deceptively pastoral State River Widening-meets-ISAN warmth (“Watching The Wires”), proceedings bounce between squelchy imaginary Look Around You-like science programmes theme-tunes (“Quoits” and “Canned Light”), watery Trumpton-meets-Jaws soundtrack cross-blending (“Frank Talks”), charmingly cartoonish mid-period Kraftwerkisms (“Analogjams”), rubbery low-end pulsing (“The Long Division”), domestic-noise collages with a hint of dub (“Sprudel”), ruralist ruminations (“Land Of Green Ginger”) and DIY-electro-inversions akin to near-forgotten Warp signings Plone (“Knowing You’re Here”). Enriched with an infectious ‘future as it used to be’ progressive ethos, this is a cleverly-constructed and consolidating calling-card.